This course provides a fundamental working knowledge of the Social Security program as it applies to retirement planning. The materials cover the history of Social Security, how to qualify for benefits, spousal benefits, widow & widower benefits, taxation of benefits, working while you receive benefits, issues involved in claiming benefits early, and strategies to maximize your benefits while developing an income stream in retirement. This is not a financial seminar; this is a financial course of study where you will leave with the knowl­edge and information needed to make decisions about Social Security benefits. 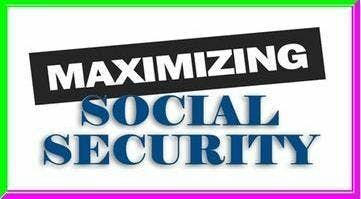 The course uses the workbook, “Maximizing Social Security” by author David P. Vick. It will be provided for you in the first class. If you are looking for answers to questions about when you should begin your Social Security benefits, how you can manage taxation of benefits, how working will affect your benefits, or strategies to get the most out of your benefits, then you will believe this course is time and money well spent. The best way to profit from this course is to follow the interactive workbook and participate in the classroom discussions as you feel comfortable. Below is an outline of the content of the course. Course Instructors come from the financial services industry. They bring many years of experience to the classroom and enhance the course with “Real World” examples of many of the principles being taught. This course is interactive and your participation is encouraged, but not required. Start at the bottom and scroll up to learn how to get to the parking lot and the room. Allow about 20 extra minutes from the time you get the parking permit (no parking ticket required on Saturday) to get to the room.